This is the bedroom side table on my side of the bed. I made the lampshade and I love how it looks in the room. The photo showing is of my mom when she was about 3. If anyone wants a tutorial on how to make the shade just let me know. The drapes are a new addition. I've been searching everywhere I could think of to find new drapes that look good in the room. Normally I make all my own drapes but I had no luck finding just the right fabric. I try and do everything as inexpensively as possible, so I tried panels from Target, Wal-Mart and TJ Maxx. I couldn't live with any of them. All those years working for an interior designer really elevated my taste level. Finally I went to a store called The Great Indoors. When I walked in I knew instantly that I had found my drapes. They were a little pricier than I had planned on but I knew they would be perfect. Fortunately, they were on sale so I saved a little bit. They are hanging now and I smile every time I walk in the room. Sometimes we have to spend a little bit more to get perfection. I can't wait to show off the rest of the room. There still more painting that I'd like to get finished before I unveil the rest. My hubby does not get it...to top it off...I have a spare, bare shade in case I want to sell one. Ok...I really mis ~spelled a few times....I meant TWO bare shades and I have ONE in my living room! The lamp shade is beautiful. I have to check out the technique! I agree with you on the drapes. I had nothing on my living room windows except bamboo shades for the longest time until I found the drapes I now love. It IS worth the wait (and the bamboo shades looked pretty good!). Okay Karen, you ARE a tease! That lampshade is the new love of my life! It's gorgeous and the best part is that it's so sentimental with a photo of your Mother!!!! Very sweet!!! Oh how beautiful. Can't wait to see the rest of the room. I love your style. Your shade is so creative and holds great memories. You did good girl!!! Sometimes we have to splurge on one thing, then save on a bunch of others and it will all even out. And you save on a lot of things by making them yourself. Keep it up, we love what you are doing. I enlarged the picture, but I can't quite figure out how you did the shade...so I guess you better to a tutorial...for all us want to know girls!! Waiting for that whole room! it's simplybeautiful! i love the lamp and the picture! That peek looks great, Karen! I have a shade I need to work on, but I know it's going to be difficult to get the fabric I hot glued on there several years ago off. I have a feeling I'm going to have to buy a new one. Can't wait to see the rest of the room ~ before I crack from anticipation! Ok, enough teasing already! Just this little peek is enough to make me swoon. I love the draperies, they are so lovely. I'm sad because our Great Indoors went out of business a year ago. I LOVED that store! I love the rose print, it's beautiful! We used to have a Great Indoors in Las Vegas, but it closed. I was so sad when it happened. It's a great store. Love the darling shade! What a great idea! I'm having a giveaway intil noon Feb 8th for two sterling silver necklaces if you'd like to stop by and enter to win or let your readers know! I know this room is going to be beautiful. I love the shade and the fact that your mom's picture is there makes it even more special. I love it when people use old family photos in my their decor. It is an instant warmth in any home. Thanks for the teaser. I can't wait to see the rest. I love the lampshades. Can you do a tutorial? I'm working on decorating my office and I need to work with the lampshades. I've being following your blog since last year. I live in the desert as well(Oro Valley, Tucson) and I LOVE the vintage, shabby chic of your house. Oh it's looking wonderful! LOVE what I can see of the drapes. The lamp shade is tooooo cute! Right up my alley as you can probably see from my last post. Absolutely love the lamp shade!!! YES, Yes! I want a tutorial on how you did that shade. I love it! The room as coming together and looking delicious! You go girl! 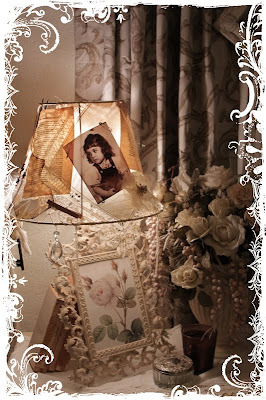 Love your 'vignette'..and PLEASE do a tutorial on that fabulous lampshade!! Hey I found my drapes there too. ( bedroom ) I am redoing my aunts house and we are on to the living room. I am sewing her drapes .I buy my fabric at Interiorz on Indian school they have great prices and are right next door to Calico Cupboards .Love that store too but that was another life when I was queen of a "larger domain" I am STILL queen but somehow the domain got MUcH smaller, but my taste as not .YIKESSSS . My place is so tiny I found myself at a doll house shop the other day what does this mean!?!? I absolutely love your blog! I look forward to visiting here. Have a great day! Knowing you, it will be fabulous! I think the curtians are wonderful, and the lampshade is fun.I think I have the very same container,,does it have a mirror under the silver lid? We are moving the end of the month. Hi Karen! . . . You mentioned a tutorial on how to make the shade. I would love to learn how to do that. I just bought 3 very vintage lamps at Goodwill and they all need shades. Since I don't have a stockpile of "skeleton" shades like yours, I am willing to tear up a couple "new" ones and redo them. So, yes, I am very interested in the tutorial! Love what you have done with the bedroom! Karen your room looks wonderful so far. I can't wait til you get finished and show the rest. Love the shade and would love a tute. I have a floor lamp I would like to redo. Love your idea. Oh, I would LOVE to know how you made your lampshade! Do tell! Everything looks beautiful so far! Can't wait to see how it all turns out! Thanks for sharing! I am a lucky girl!!!! It's time for the winner!! !